Update 8/7/07: Hemlocks which still appear to be healthy along the Parkway and Linville Falls are likely ones which have been chemically treated, rather than helped by the predator beetles. Hemlocks are dying rapidly where untreated or treated only by the predator beetles, and it appears that the biological control method will be ineffective. Since chemical treatment is difficult to do large-scale, it looks like we’re losing the war. Article originally posted Sept. 11, 2004. Spears of morning light shoot through the forest as tiny, winged seeds spin down through the beams like flying insects, or a light snowfall. Light from the rising sun warms one side of the trees’ tiny cones, and a gentle breeze a hundred and fifty feet above stirs the seeds into falling. Steam rises from a log on the forest floor. The sunlight has found its way to this log only thorough a hole in the nearly unbroken forest canopy far to the east. Staying shaded nearly all day log, the log remains wet, and vibrant green moss covers its entirity. Close to the log, a stocky, dense, furrowed trunk rises from the needle-covered forest floor. If you stare at it and let your peripheral vision fade, it appears so large and nearly flat it looks like a wall. Nearby, a cold, clear stream babbles merrily and a rare brook trout flashes through a patch of sun. You are standing in a centuries-old hemlock forest at sunrise, and you feel like you’ve been taken back to a place in time when humans thought the forests were infininte. A miniscule insect, the Hemlock Wooly Adelgid, has infested the hemlocks and threatens to kill each and every one. It is barely visible to the naked eye (and that’s if you have good vision). Introduced into the United States from Europe in the 1920’s in the Northwest, the insect had little effect on the hemlocks growing there. The Western trees showed a natural resistance. However, it was found in the East – in New York – in the 1950’s, and something else was discovered along with it: the fact that Eastern hemlocks have little resistance to the bug and suffer and die once infested. From here, the little pest began spreading into landscapes and gardens, but the real disaster occurred when the Adelgid infested natural forest stands of Hemlock. It began spreading north and south, and in areas that have been infected for a long time now, the results are devastating. In the Shenandoah National Park, for example, over 80% of the park’s Hemlocks have died since infestation in the early 80’s. The Hemlocks at Linville Falls, as well as several other important areas of Western North Carolina such as the Great Smoky Mountains National Park and the Joyce Kilmer Memorial forest, are now infested. As of this writing, much of Western North Carolina’s hemlocks remain healthy and un-infested, but that is sure to change. Pockets of infestation are showing up more and more frequently, and some trees have started to die already. 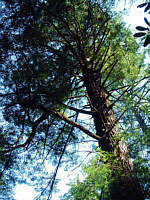 (Edit 8/7/2007 – all hemlocks across WNC are now infested, and most are in severe decline. Large expanses of hemlock groves are now dead.) Once infested, trees are mostly dead within 5 years. 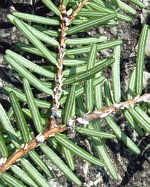 An infestation can be identified by looking at the underside of a lacy Hemlock twig. If it’s infested, you’ll see small, grain-of-rice to q-tip sized puffs of cotton-candy looking substance at the base of each needle. This is a sure sign of infestation, and it means the devastating insect is actively sucking the life out of the needles and injecting a poisonous saliva as well. The needles will be come dull, and fall off easily. The tree will be unable to put out any new growth and will probably die within a few years. Enjoy the forest you are in, because it may not exist much longer. This forest, consisting of centuries-old trees, may be completely dead within 5 years. (Update 8/7/2007: We’re on target for that.) Many trails would almost certainly have to be closed, because falling limbs and trees would be extremely dangerous. The scenic view of the Linville Falls area would be completely ruined; economic losses from reduction in tourism would be immeasurable. The plants and animals that depend on the Hemlock environment would be potentially devastated. Hemlocks protect streams from direct sunlight, keeping the water cold and curbing erosion to help keep it clear. Loss of hemlocks could spell the loss of aquatic species that depend on the shaded water. And watershed cleanliness – that’s right, the water you drink – could be compromised. Several species of birds depend on the Hemlock for their very survival. Loss of the Hemlock could be a disaster of mega-proportions, similar to the one suffered with the Chestnut blight early in the century, but perhaps even more devastating. When the Chestnuts were killed, several species of oak were able to adequately fill the niche that the Chestnuts had previously held. But with the hemlocks, there is no species that could do this. This forest type might be lost forever. And it’s all because we brought the pest into the forests. 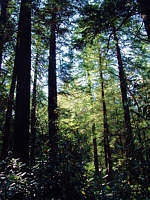 Tsuga Search – project by the Eastern Native Tree Society to locate and document the largest Hemlocks in the Smokies. These PT Beetles have been infesting my home daily for the past week. Not just one or two, but THOUSANDS have been removed. They crawl in through cracks in my (log) home and seek out the warmth of windows and sunny locations. They are all dead by the next morning. It takes me hours to sweep up their remains. This is the second year this has ocurred with the PT Beetles, I live in the Cowee area about 8 miles north of Franklin and about 3 miles east of the little TN River at aprox 3K feet in altitude. Really! All the information we get from the folks releasing the beetles says that they don’t colonize like this, and that they don’t reproduce fast enough to make swarms. Well, it stinks that you’re having trouble with them – but maybe if you’re seeing that many of them, they’ll be able to put a dent in the adelgid population after all! If the situation is really so bad, which I think it is, should we be saving the seeds of these trees as well as others that may be lost in the Appalachian highlands? Since January I’ve done the AT in GA/NC. I’ve hiked around the Blood Mountain/Vogel area. Did several trails in the Smokemont, Twentymile, Lakeshore Tr. area in the Smokies. The Hemlocks even at lower elevations are starting to thin out, at first the bottom and working its way up. It is very, very sad to behold this rapid devestation. Look, when you see the smog over Atlanta or Knoxville or watch runoff from dirty streets flow into a river or see these huge magnificent ecosystems decline into something less than they were (as with the logging of the late 19th and early 20th century) you feel ashamed of this whole system human beings have created. The same one I begrudgingly take part in every day. my friend in gerton has had swarms of these beetles as well and unfortunately tonight i saw my hemlocks with the aldegid bugs. can i save my trees? We have been successfully been saving thousands of hemlocks in the area. Research is progressing, and hopefully the numbers of predator beetles in the area will be enough to one day reduce the adelgid populations to tolerable levels. Until then, chemical treatment is the only way to keep our trees healthy. I recently hiked the Linnville Falls area with my six year old daughter and have seen the devestation from ‘Erwins View’ (its quite sickening) – I also witnessed worse in Shanendoah National Forest. It seriously breaks my heart to see the gray siloettes of once majestic trees and to think that the remaining ones will likely suffer the same fate. maybe im not the first to think of this but couldnt we be planting the seeds of the western resistant varieties among the forests in the east along with the ones being treated and in the areas where the beetle are being released. Im not educated in this – but could they hybridize or pass on the resistancy to the future generations of trees??? I don’t think the Western variety can grow in our forest conditions; the foresters have said that there is “no replacement” for the Eastern Hemlock. And typically, foresters and biologists don’t like to release non-native plants and animals into the environment – even if it’s to replace one that we are responsible for killing. An exception to this was the well-researched PT beetle, which was released to help combat the Hemlock Woolly Adelgid. Unfortunately, it has largely been a failure, as the dead trees at Linville prove.